PSA CEO Carlos Tavares gets the volume he needs while GM CEO Mary Barra unloads a money-losing business. DETROIT -- General Motors' decision to sell its European operations doubles down on a bet that the company can win by being less global, but more profitable, in an auto industry increasingly driven by software. Without the Opel and Vauxhall brands, GM last year would have sold about 8.8 million vehicles -- well behind Germany's Volkswagen Group and Japan's Toyota Motor Corp. in the race to be the world's largest automaker by vehicle sales. Opel and Vauxhall combined sold nearly 1.2 million vehicles in 2016, and generated $18.7 billion in revenue, about 11 percent of GM's total. However, all of GM's activity in Europe -- the investments in new model designs and cleaner engines, the efforts to make factories more efficient and the wages paid to 38,000 employees -- has generated nothing but losses since 1999. Meanwhile, GM's business in North America has boomed. GM's home market operations were reborn as a smaller company due in part to the U.S. government led bankruptcy in 2009, with fewer brands, fewer dealers, fewer employees and far less money owed to creditors and retirees. Since 2009, cheap gasoline has powered a boom in sales of high-profit pickup trucks and SUVs, lifting GM's North American pre-tax profit margins to just over 10 percent in 2016. To keep its North American profit machine revved up, GM will have to invest in new SUVs and trucks, as well as expensive technology to enable those trucks to meet rising federal fuel economy targets. Europe is demanding cleaner cars, too. But far less of the technology GM would buy to clean up European diesels and tiny gasoline engines would be useful in the U.S., where larger gasoline engines, including eight-cylinder motors used in pickup trucks, dominate the market. GM has concluded that it cannot achieve significant economies of scale in emissions technology for Europe on its own, company executives said. PSA CEO Carlos Tavares is wagering that he now can gain an advantage against rivals such as Renault and Volkswagen with the help of the added revenue and sales volume provided by Opel. 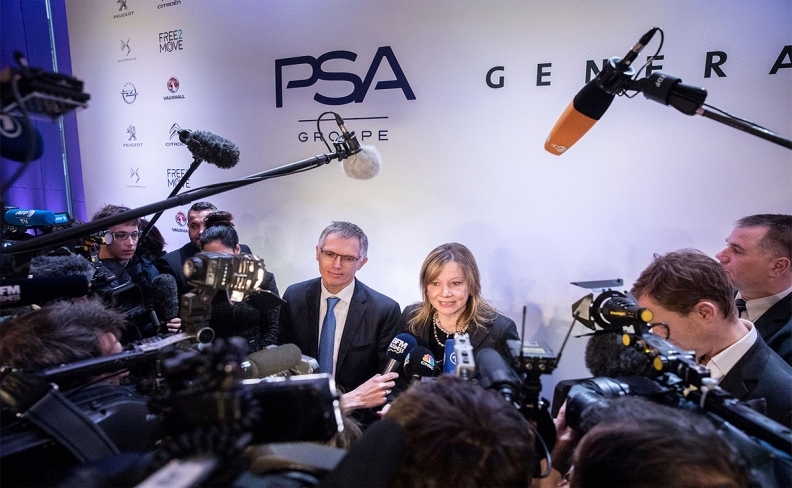 France's PSA, the maker of Peugeot, Citroen and DS cars, announced a deal to buy GM's Opel division on Monday. GM's decision to walk away from Western Europe highlights two other profound shifts since 2009, when GM's board scuttled a deal to sell Opel and Vauxhall to a group led by auto supplier Magna International and Russia's Sberbank. The first is China, now the world's largest auto market with roughly 28 million vehicles sold in 2016, and more growth forecast to come. As China grows, GM will need to shift more vehicle engineering money and capital investment to feed that market - which could eventually replace much of the global sales volume sacrificed by the sale of Opel to PSA. GM's Buick brand, its primary brand in China, and the Wuling brand of small commercial vehicles GM builds with partner Shanghai Automotive Industry Corp., each outsold Opel and Vauxhall in 2016. The second factor is the race to transform cars into electrified, intelligent devices that are paid for by the mile instead of purchased on installment plans. Asked last month whether GM needed more radical restructuring to lift its share price, GM CEO Mary Barra pointed to "the way that we are investing in the future, which I think is a huge opportunity, with transportation-as-a-service," and to "the opportunity that technology has to transform this industry" as factors that could change how the company is valued. However, investors have not changed their views yet. Gary Silberg, head of KPMG's Americas automotive practice, said that when it comes to the digital systems and the people required to collect, analyze and manipulate the terabytes of data required to make a car drive itself, Silicon Valley companies such as Google parent Alphabet Inc. and ride services leader Uber Technologies Inc. have the edge. "The war for talent is absolutely essential to winning in the market place," Silberg said. And those adept in artificial intelligence systems "are not going to work for the auto industry." GM demonstrated the new economics of the industry last year when it agreed to pay $500 million -- and potentially more -- to buy a tiny San Francisco robotic driving technology startup, Cruise Automation. Ford Motor Co. followed suit with a $1 billion deal to bring aboard and fund the future work of robotic vehicle startup Argo AI. GM's Barra has told investors that GM would deliver 20 percent or better returns on invested capital, and hold capital spending roughly flat with current levels of $9 billion a year, putting extra cash into share buybacks. Those constraints on capital force tough decisions, Barra and other senior GM executives have said. The decision to abandon Opel after nearly 80 years is the most momentous yet, and the success or failure of the bet could define Barra's legacy.